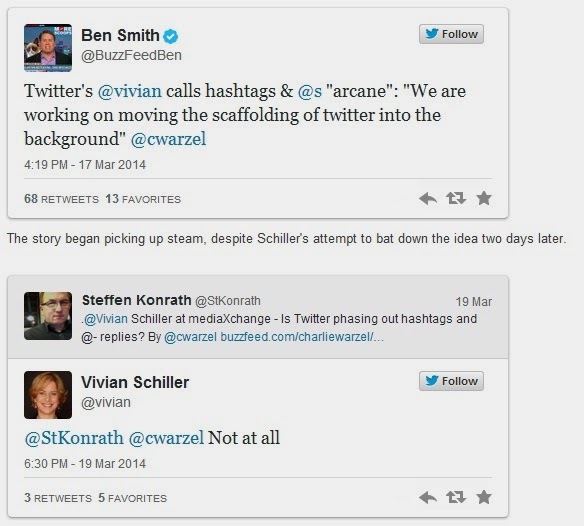 Twitter's head of news, Vivian Schiller, momentarily sent Twitter into a self-reflective mini-frenzy when she revealed that the service might be eliminating some of its core features, namely @-replies and hashtags. For now, the @-reply is the only way to connect a tweet with another account, and the hashtag is the main way to connect with a topic. Without the @-reply, the person you're trying to mention in the tweet would not get a notification. Although keywords can sufficiently connect topic-based tweets, the hashtag is the strongest and most effective tool for the collection of tweets around a given subject area. Schiller made the comment during a speech on Monday at the Newspaper Association of America mediaXchange 2014 event in Denver, according to BuzzFeed tech editor Charlie Warzel and editor in chief Ben Smith. In initial reports on the Schiller's talk (and tweets using the event hashtag #MXCTwitter), the word "arcane" never comes up. 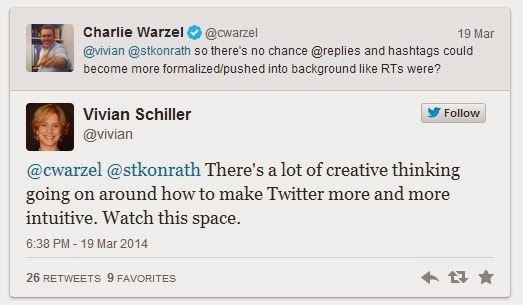 The big question remains: Are new users turned off and confused by @-replies and hashtags? Perhaps, but keep in mind that Facebook, a much larger social media platform used by perhaps a less tech-savvy and news-focused audience, adopted hashtags last year. Google+ still uses the plus sign. Are any of these codes or symbols intuitive? For now, the jury is still out on Twitter's plans for its core components, but as Schiller advised, it’s worth watching this space. In your own opinion, do you think Twitter should get rid of the @-reply and hashtags?